The former president believes that a new government, with a progressive vision for the country, can take Brazil out of the quagmire in which it is today. Interview with Luis Inacio Lula 1. In your opinion, what was the reason for the coup against Dilma Rousseff? As a matter of fact, the conservative forces never accepted the outcome of the 2014 elections. The majority of the people voted for the continuity of the popular government and rejected the return of neoliberalism, but the right-wing refused to respect the people’s democratic choice. They have the media monopoly and an enormous economic power, so they were sure they were going to defeat us. But despite the massacre of the press against us, the population did not allow itself to be manipulated. They voted to stop the historic setback announced by the tucanos [members of the PSDB], they voted so the country would keep following the path of national independence, development, income distribution and social inclusion. Just the day after the election, the sabotage against Dilma's government and the conspiracy to overthrow it, began. It was damaging agendas after damaging agendas, both in the Chamber of Deputies and in the Senate, to cripple the economy, to scare investors and consumers, while government projects, so necessary to the country, did not pass or were completely disfigured. What has become more clear by now, even for many people who have been deceived by the lies of the press, is that it was not a coup only against Dilma or the Workers' Party [PT]. It was a coup against public education and healthcare, a coup against the rights of workers and pensioners, a coup to privatize public enterprises and the Pre-Salt, a coup to denationalize the Amazon, a coup against the country. 2. How do you evaluate the role of the media and more specifically of Rede Globo in the Coup? The great communications monopolies were decisive for the coup. Rede Globo, in particular, was one of its main articulators and its great propagandist. The coup would not have been possible without the systematic attack and sordid campaign of demoralization that Rede Globo made against Dilma's government and the PT. 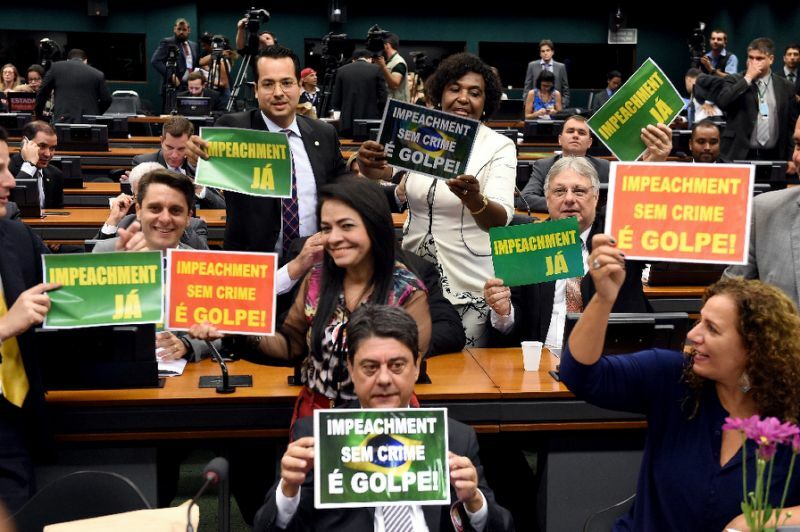 To ease the path the coup, it helped stifle the accusations against the coup leaders (the shielding of Aécio Neves is a blatant example of this), which would only appear after the President was overthrown. Globo did not hesitate to ally itself with Eduardo Cunha to sabotage the government and scandalously protected him until he finished his dirty work. It sold to the country the false idea that all of the nation’s problems were created by the PT, and that removing the PT from the government would suffice - even if it would hurt the rule of law and democracy - for Brazil to become a marvel. Today, without any shame, it tries to convince the workers and poor people that the people will live better without labor rights and retirement. 3. Sérgio Moro, a judge from a lower court, convicted you in the legal action regarding the apartment in Guarujá. You are also being prosecuted in other judicial processes. Why are you being prosecuted by Justice? 4. If elected, what steps will you take to improve the lives of the people and the course of the country? It's early to speak as a candidate, much less as an elected representative. Rather, we must prevent the coup plotters from destroying the social rights that were hard won by the Brazilian people in the last decade. And prevent them from privatizing, at a despicable price, public enterprises. And it is also necessary to ensure that the next elections are indeed free and democratic, that the attempt to criminalize left-wing and popular movements does not prevail. But I do not doubt that Brazil has a way. I really trust in the future of Brazil. A new government, a legitimate one, the fruit of the popular vote, with a progressive vision for the country, can perfectly take Brazil out of the quagmire in which it is today. We have already ruled the country and proved in practice that Brazil could be a sovereign nation, with real economic growth, job creation, income distribution, social inclusion and expansion of educational opportunities at all levels. For this, it is necessary to believe that the popular classes are not a problem, but a solution. When the poor of the city and the countryside can buy again, that is when business will sell again, and industry will produce and with that, investment will return. It will also be very important to elect a better Congress than the current one, with more representatives of the workers, peasants, women and young people. 5. For all that Brazil has been through - such as the coup, unemployment, corruption, media manipulation - many people do not believe in politics anymore. What should we do in the face of this hopelessness? I do not think we have the right to give up. My mother taught me that. We always have to fight, always try to make tomorrow better. I'm 71, and I do not want to give up, so a young man has no right to give up. I did not give up surviving when I was born in a region where many children died before the age of five. I did not give up organizing the workers during the dictatorship. I built with my companions the largest political party in Latin America, and I was president of Brazil for two terms, the best evaluated by the people until today. If I got all this without a college degree, no rich dad, why should a young man give up? If you think politics is bad, get into politics and try to yourself, be the militant or political leader you dream of for Brazil. 6. Today, who are the main adversaries so we can have a country with social justice, solidarity and opportunity for all? I think today there are a lot of people resentful in Brazil, many people who are in a bad mood, thinking that selfishness will solve something. Many entrepreneurs want to take the rights of workers and retirees without realizing that if the worker and retiree do not have money, they will not consume what is produced. The great strength of our economy is the internal market. Then he may think he's going to do well as an enemy of the workers and eventually his sales will fall. Some people resent the improvement of the life of the poorest and want a country for the few, only for a third of the population. Some people defend almost going back to slavery. These people need to understand that this is not good even for them because a country for a few is a weak, insecure, unstable country. Such a country does not attract foreign investors, it attracts only parasites in search of quick wealth, that come to extract natural resources or buy cheap companies. A society of solidarity is not only a matter of justice - even if it is the most important - but also of necessity. When the poor and the workers improve their lives, the whole society lives. 7. What do you recommend regarding organization and focus to the Brazil Popular Front [Frente Brasil Popular] to advance the fight against the setbacks and for democracy? I think the Front is an extraordinary thing because it brings together different sectors of society - workers from the countryside and the city, women's movements, racial equality movements, against sexual discrimination, environmentalists, young people, not to mention the progressive intelligentsia - to analyze Brazil and to fight for its transformation. It has been fundamental in resisting the political and social setbacks. And it certainly can be very important in the recovery of a popular project for the country. I think the focus of the Brazil Front is correct, combining formulation and permanent mobilization. I also think it is very important that we explain to the people what we are advocating. Even for those who have been in favor of the coup, so they can realize that they have been deceived and are also losing their labor rights and their retirement benefits. It is necessary to give hope to the people that another Brazil is possible and that, with a popular government, better days will come. 8. Often, politicians decide the lives of Brazilians and the country in closed in offices in Brasilia. You have already made many trips through the countryside of Brazil, in caravans like this one, now, in the second semester. What did you learn about our people in these experiences? I learned that the Brazilian people are very strong and are very generous and that one cannot govern the country from Brasilia, from the Paulista Avenue or the south zone of Rio. For someone living in these regions, a program like Lights for All may mean nothing. But it brought electricity, brought many Brazilians to the 21st century. Without light, a young man cannot study. Without feeding himself, with a good lunch at school, the young man cannot study. We have created the Food Acquisition Program, which supports local farmers and reinforces the school lunch with healthy food, and today it is being destroyed. The children have to eat, but they also have to have clothes to go to school. To receive the benefit, the Bolsa Família requires that the children go to school. Without transportation, a young man from the countryside cannot study. We created the Caminhos da Escola program, which took school buses through the countryside of Brazil. Without water, how can you live, even more, study? We installed millions of cisterns in the hinterland. And if you do not have a college, how do you study? We expanded universities, Federal Institutes of Education, technical schools, bringing them to the countryside. There were hundreds of new university extensions in every state of the country. Bahia had only one federal university; today, it has four. I know the size of this country personally, that it is not small, and whoever governs it cannot have a small mind or soul. You have to listen to the people, take the road, talk, seek solutions, give strength to civil society. And you have to open the palace to the people, to make civil society participate in the construction of solutions for the country. 9. How do you evaluate the US government's threats in the face of the situation in Venezuela? How should Brazil have acted in the peace process in Venezuela?